This year, my intention was to go to France, and travel to different cities for the Euro’s Cup 2016. Hix, it didn’t happen because Mister’s nephew had decided to have a destination wedding in Puerto Rico, so we’d have to come back to Puerto Rico for the second time. 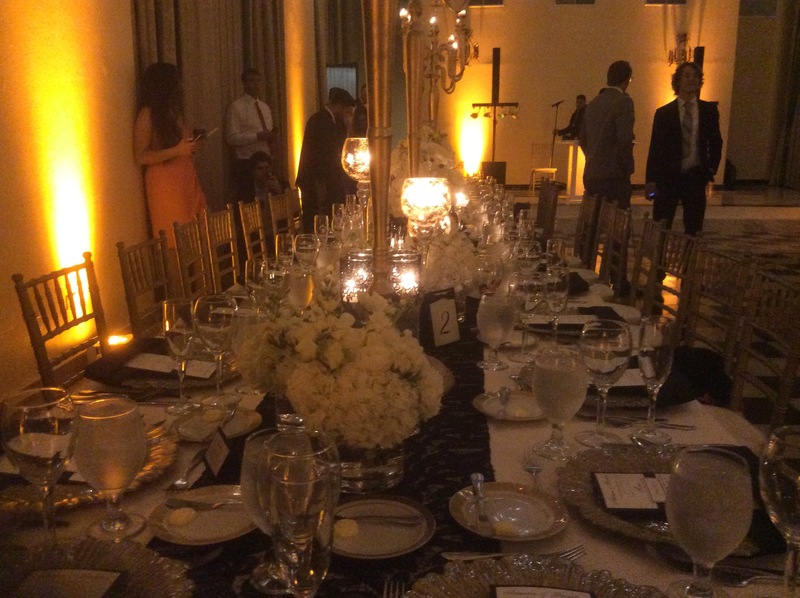 The wedding was beautiful in Old San Juan. 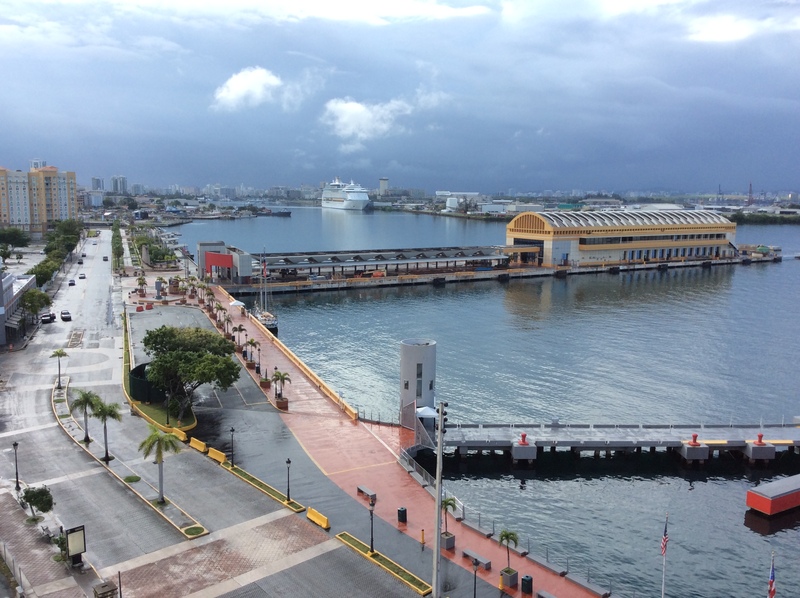 Day 1 and 2 Marriott Condado – Travel to Puerto Rico. 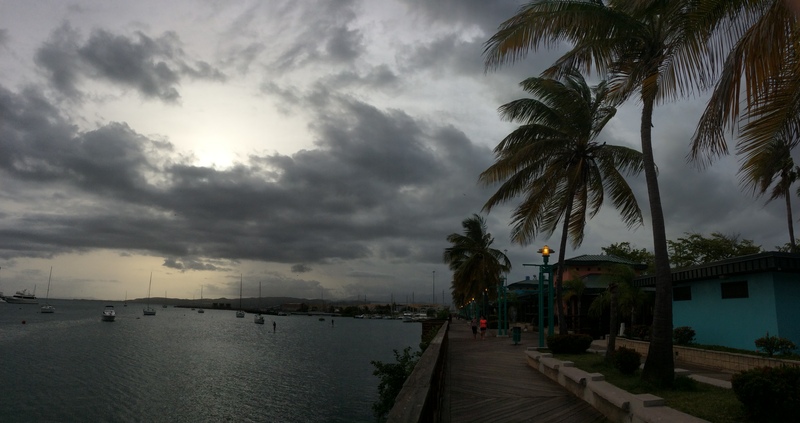 Hanging out at the beach and snorkel at Condado Lagoon. Wedding. We mostly wanted to snorkel as I bought us some high quality fins. Our goal was to wake up to snorkel at different reefs, and different beaches everyday. So we rented our own car ($435 with bumper to bumper insurance, Mr.W was driving so he wanted to be sure that he doesn’t get accountable for any bumps driving in Old San Juan or anywhere else on the island). To keep the budget as low as possible, I had applied for Holiday Inn, Marriott and Sheraton credits card to take advantage of the bonus points. Nonetheless, the parking cost might come to $300 include airport parking, hotel self-parking, and valet parking. 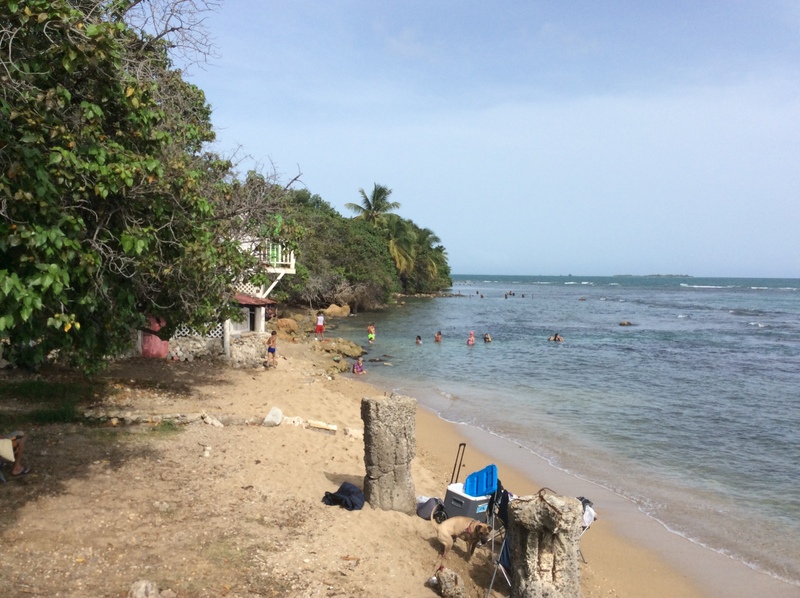 As we walked down the broad walk searching for food and just tour the beach front area, at the very end of the strip, we spotted an area where people were hanging out, we even found a couple of snorkelers. And looking down from the bridge, we found so many big fish that was circling, and chilling. LOL 🙂 We knew then, it was the spot. 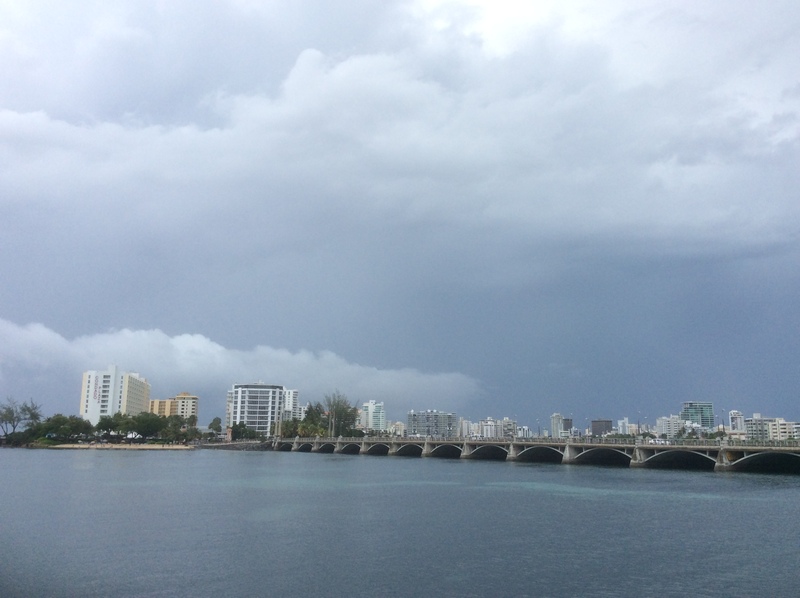 Condado Lagoon Beach – in 1994 there was a big oil spill, one of the stipulation of the settlement is to rebuild the corel reef area. So they build an underwater trail with 36 corel reef to attract more fish and water plant and seaweeds. As we all have know the corel reef purpose was to prevent flood and big wave whenever there is a big storm, the fish needs the reef for shelter, and the reefs need the fish to growth, as a part of the eco-system. With our new fins, we were able to swim 100-150 meters out (notice: neither one of us are strong swimmer, we were barely able to swim prior to discovering the magic of snorkeling heheh). That was where we saw the underwater trail, it was so cool to see so many fish. So the mixed review was probably comprised with people who couldn’t find the place, or when they were out there, they didn’t know where to dive. Icasco Island – We spent Fri, Sat, and Sun for wedding events, so we were ready to hit some nice reef after we get out of San Juan area. 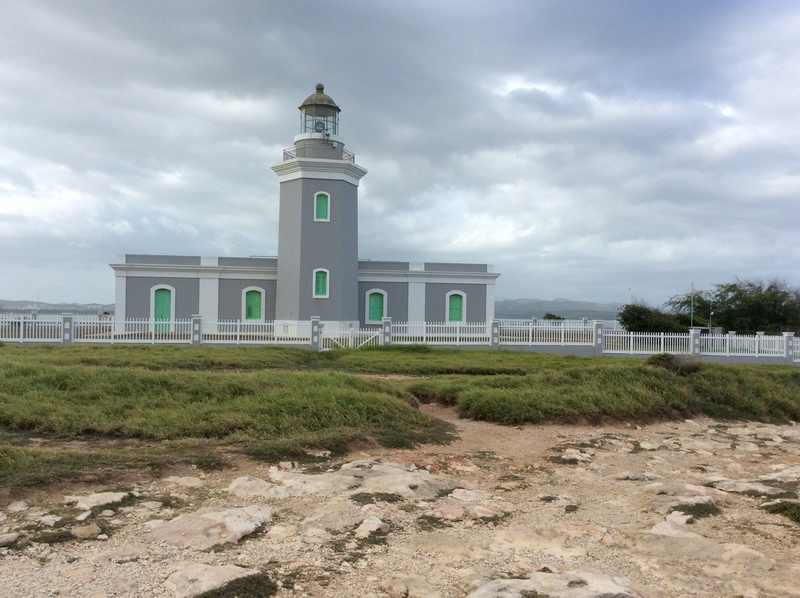 We want to go to Culebra Island. However, the ticket were all sold out, we arrived at 7am. I was told we had to come back at 1am, there would be a line there. But I was determined to get some snorkeling. I called around that morning, and the only tour boat I could find was the Salty Dog Catameran. They took us to Icasco Island. With these tours, they would take us to the sandy beach area to have newbies practice snorkeling on shallow area first. There was a bunch of kids on the field trips, so they were happy to be in the shallow area. Mr. and I took a long swim with our fins down to the rocky area, there we find tons of colorful fish. The swim back were against the current so we decided to walk back. It was pretty awesome. We took a day off from the beach to check out the rain forest. We found El Yunque again with ease. The pictures were even more breathtaking this time around. 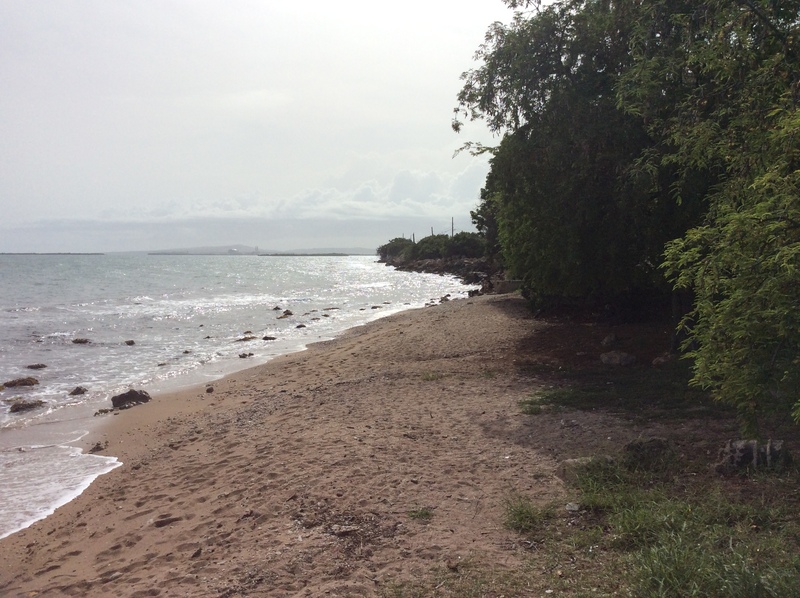 Gulligan Island – It didn’t take us that long to find the bay. We opted to use a speed boat to go to the island to avoid the long line ($7 vs $10). The review said the island were good for little children. Which was all true – the water was clear and calm, with many reefs to see. We went to the remote part of the island and the water was deeper, and the fish was super colorful. We also snorkeled around the mangroves. There was a family offered us some chicken on the sticks, it was super good. Thanks again for your generosity. 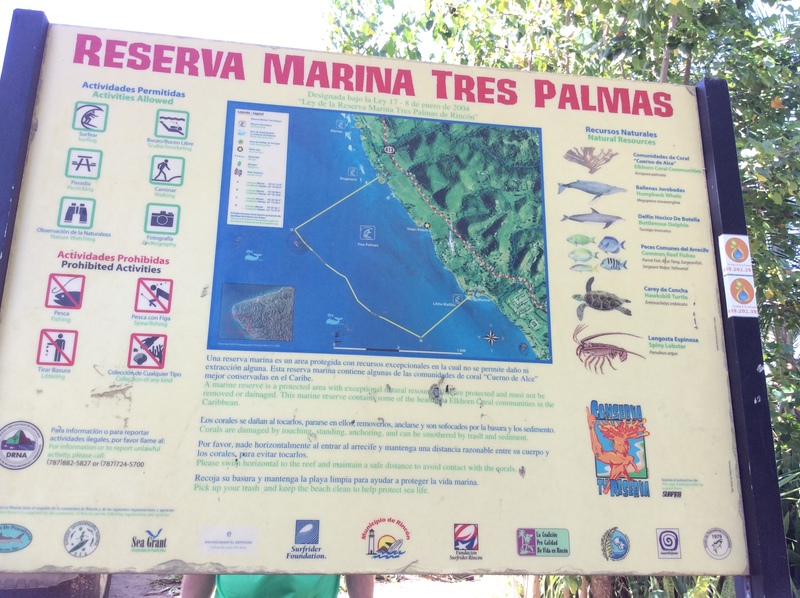 Las Palmeras Beach – Ack! This beach wasn’t even on the map anywhere. We can’t find it on Google maps or iOs maps! What a jerk! haha. I read the review over and over, trying to find some clues. I knew it was off PR-2, so I happened to run into some local and they pointed out it was about 3 minutes from Holiday Inn. We circled 3 times before we found some locals hanging around in the nice and calm blue beach. A, hah!! Jackpot again! It was immediately off of the highway, so it was a quick stop, so please be careful as the cars behind might hit you. The fish in this area wasn’t as colorful, maybe it was around 3-5PM when we got there, so it was darker, they were supposed to be blue fish?! It was a little big too shallow for Mr. to freely swimming around. Outside of the reef, the current could be super strong. I happened to wear my fins so we 3-4 kicks, I was able to get back in. LOL 🙂 On this beach, we also spotted so tamarine trees. I climbed up to get some … too sour haha!! But it was a great experience as my childhood memories flood back. hahah. I love it! Step Beach – Oh la la! It was so nice! I thought, traveling to Puerto Rico in the summer would be a mistake. It wasn’t. 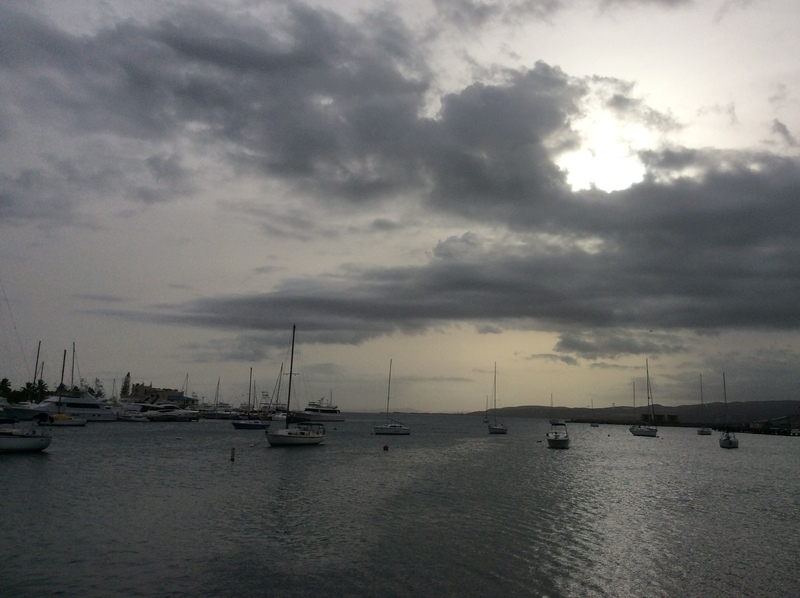 The weather could be moody with the rain comes and goes, but it does goes! But the temperature would stays around 80s, the water was super warm, and this beach was special. In the winter, you’d find 20 ft waves, however, in the summer, when we came, the water was so calm, there wasn’t even a big wave taller than 1 foot. It was absolutely perfect for snorkeling. We’d find tons and tons of fish. Oh my! I even found a long big water snake. The school of big blue fish was magnificent to witness and I could just swim with them and watching them each the food off the reef. There was so many elk-like reef that I haven’t seen anywhere before. I couldn’t use enough adjective to describe my feeling. We spent 5+hour at the beach. By the way, you can’t find this one off google map either. LOL 🙂 Just have to shake some locals down to get some info. haha! Reading my post sounded like we on a run every single day. We weren’t. We slowly wake up in the morning, eat breakfast either at the hotel or the highest ranking on tripadvisor or yelp. haha LOL: Then we’d take the scenic route, hugging the coast of Puerto Rico prior to reaching to our destination. It was as perfect as we wanted to be. We were on vacation, we’ve already saved so much on hotel, that I was willing to spend a little more here and there so we can have the best and relaxing vacation as we wanted to be. LOL. It’s great that I’ve reached FI, at this time, any hours that I put in at work, that’s more for traveling and enjoyment and it and extra amount will be invested for extra leverage. It’s totally awesome! We still have three more vacation weeks coming up. We haven’t decided where to go just yet. My life is still hectic as I’m getting back to work, plan my own wedding, and a couple more things to clean up at rental properties. So blogging might still be slow for the coming months. What’s about you? Where have you been on vacation this summer? Any plan for the future? Cashing in on Pokemon Go – Who are the winners? Sounded like you had a great time! Thanks for sharing and all the best! Looks awesome Vivianne. I’ve never been, but that will change! With the financial troubles on the island, I am sure the trip was cost effective. How was the petty crime (pick pocketing etc)? It’s still America, so it’s as safe as it can be. We saw a couple of homeless guys on the street, but they are no where near as aggressive as New York City homeless guy in the 90s movies. 🙂 they were just sleeping or on a motor cart. Puerto Rico is going broke and unable to pay bills, they try to make it more appealing to congress to,bail them out by having taxes increase. Sale tax were 12%. That means we pay $120 for every $1000 we spent. It was really high compare to the 7% we were paying in 2015. That was my biggest complaint. Thanks for the followup. We must get down there. I’ve wanted to sail from our Florida home….and now that we have more time, we just might. That will be a few years in the future though! I hope your week finishes up well. Wow sailing is great! We hope to learn someday. What a beautiful place! I am glad you had a good time. I’ll put this in my list to go except my swimming skills are non existent. And it’s very close, which means no jet lag and crazy hours on a plane. The ski belt was good because unlike the life jacket, it doesn’t get in the way if we want to swim the long distance. It might resist a little bit, but not as much as the life jacket. Food was great. We always went for 4-5 stars ranking restaurants, ordered the fresh catch or the best rating food on the reviews. 🙂 we only have room for 3 meals/day, so we want to be a little bit selective on what we put in our stomach. Unlike Southeast Asia, the portion in the Americas are huge. If we finish the meal, then we don’t have anymore room for more restaurant, or food cart, food truck. Seems like you had a pretty good trip there even though there were some rains. Coincidentally, we also had a summer vacation by the beach recently at Krabi, Thailand. It’s a bit far for you there but I think it’s worth to try out too in the future. This is my experience which I wrote in my travel blog (hope you don’t mind the link).